Frazer’s .338LM rifle is a Remington XCR Tactical Long Range with a Vortex Viper Precision Shooting Tactical 6-24x50 scope, Vortex Precision matched rings, a Harris bipod, a Nightforce 20 MOA rail, and a Badger Ordnance bolt knob. Back in 1982 the United States Department of Defence approached a small defence projects firm known then as Research Armament Industries, or RAI (owned by the late Jerry Haskins), to develop a new long range sniper rifle and cartridge. 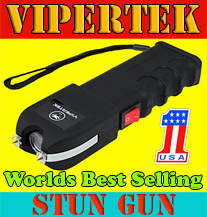 The new cartridge had to be able to push a 250 grain bullet at 3000 feet per second and be able to penetrate five layers of standard Kevlar at extended ranges with enough residual energy to incapacitate the target. To achieve such optimistic goals RAI elected to go with a 0.338” diameter projectile as this had long ago been found by the US military to be the optimal size for both dimension and payload. The .338 offered excellent sectional density for penetration while allowing plenty of room to carry a penetrator inside the projectile for armour piercing applications, or an incendiary core for multi-purpose ammunition. In order to drive such a large projectile to the prescribed muzzle velocity RAI decided to initially neck down the .378 Weatherby to .338. Unfortunately the .378 WBY was not suitable as it’s a relatively straight-walled case and is a belted magnum design. The lack of body taper meant that when fired at high pressures or in hot climates the cases had a tendency to stick in the chamber and the belt also presented some reliability issues when feeding from a magazine. As those of you with service rifle experience will note most cartridges intended for military service are designed with a generous body taper for positive extraction – to ensure absolute reliability in life or death situations. The next possible parent case was the .416 Rigby which is a rimless big game cartridge designed in 1911 by John Rigby that earned its reputation on the dark continent hunting some of the world’s most dangerous game. The large case capacity and generous taper made it an excellent parent case and it was necked down and shortened to 71mm. This cartridge was known as the .338/416 or 8.58x71mm. At this stage RAI contacted Brass Extrusion Laboratories Limited (BELL) of Illinois to produce brass and Hornady Manufacturing to produce a .338 cal 250 grain hollowpoint boat-tail projectile. RAI produced two models of the Haskins Rifle for the looming trial. These were the model 300 (.338/416) and model 500 (.50 BMG). Left to right: Hornady 285 BTHP, Belmont 250 Scenar, 250 Grain Scenar handload, 285 Hornady A-Max handload, and a .416 Rigby for comparison. During initial testing in 1983 the cartridge was failing to meet the goals set by the Defence Department. This prompted RAI to approach the Finnish firm Lapua in 1984, who produced brass and a .338 cal 250 grain full metal jacket lockbase projectile. The RAI .338/416 rifle combined with the Lapua ammunition was a match made in heaven. This combination went on to win the 1000 yard US Navy rifle competition in Quantico, Virginia in 1986. 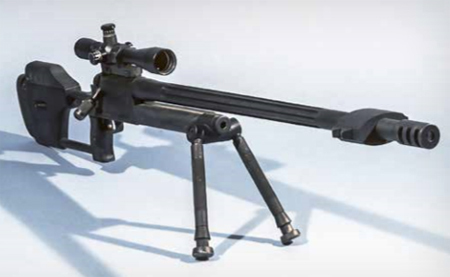 Unfortunately for RAI the Defence Department decided not to purchase the Model 300 however and opted instead to purchase a small number of .50 BMG Model 500 rifles (which saw combat in Beirut during the Lebanese Civil War). While still debated, it is thought that the choice to adopt the .50 BMG was due to its proven ability and the known quantity it represented over the new wildcat .338/416. Ammunition supply issues for the wildcat certainly played a part but the main factor has to be the inability of the .338/416 to reach the original project goals of a 250 grain projectile at 3000fps. The loss of the major US contract meant that RAI fell into financial difficulties and was subsequently sold to the IverJohnson Company. Lapua was essentially left alone with the new cartridge and having seen its potential decided to pursue its development. Lapua had identified a number of issues with the parent case that had reduced its ability to deliver the velocity required for the US contract. The .416 Rigby is a large volume case that has relatively thin side walls. This is a throwback to its birth when cordite was the preferred propellant by all major ammunition makers. During firing the area just forward of the web is unsupported by the chamber and as it expanded to fit the dimensions of the chamber it was stretching at this point and eventually cracking. This was due to the high powder charges required to try and meet the velocity goals of the project. Lapua recognised this fault and elected to redesign the case structure and strengthen it forward of the web where it had been previously splitting. They also shortened the case and altered its metallurgy so it was harder towards the thickened web and softer towards the case mouth. The result is a case that was renamed the .338 Lapua Magnum and could with stand pressures of 4200 BAR, whereas the .416 Rigby could only withstand 3000 BAR. Lapua submitted the new cartridge to CIP in 1987 and the new case was accepted in 1989. 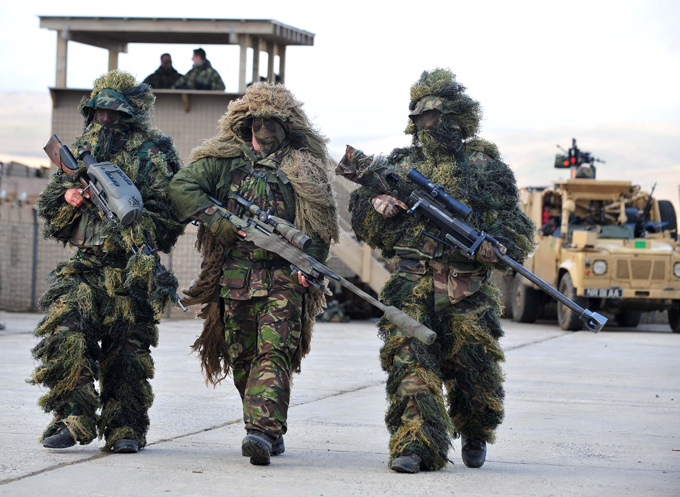 Soon after it went into service with the Dutch Marines and became NATO codified, allowing it to be used widely by defence forces around the globe. 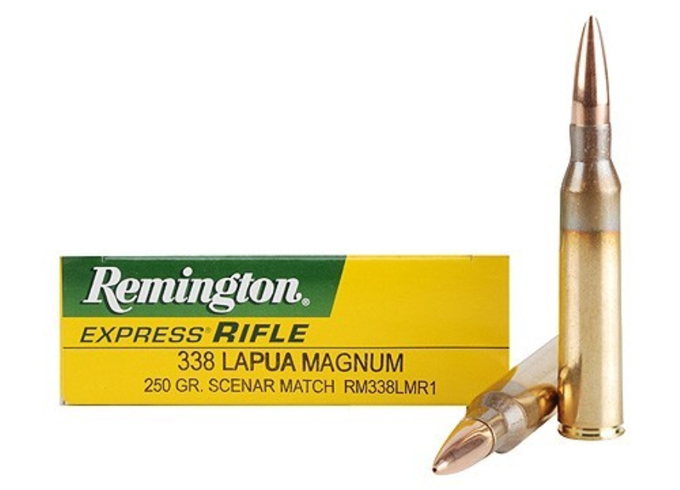 Today the .338 Lapua Magnum is a widely popular round for military and civilian applications. The cartridge has proven its effectiveness in both recent conflict and on the precision rifle competition circuit. Although the initial aim of the “338” project was for a 1000 yard rifle, the reality is they created a 1500 metre rifle. The Haskins .50 BMG rifle was initially favoured over the .338 version. The .338 Lapua Magnum represents the middle ground in terms of performance between the 7.62x51mm (.308 Win) and the .50 BMG. Rifles chambered in .338 Lapua Magnum are lighter than their .50 BMG counterparts and with modern special purpose ammunition are capable of performing limited anti-materiel applications as well as anti-personnel (ie; the .338LM can be effective against light vehicles etc., as well as enemy combatants). 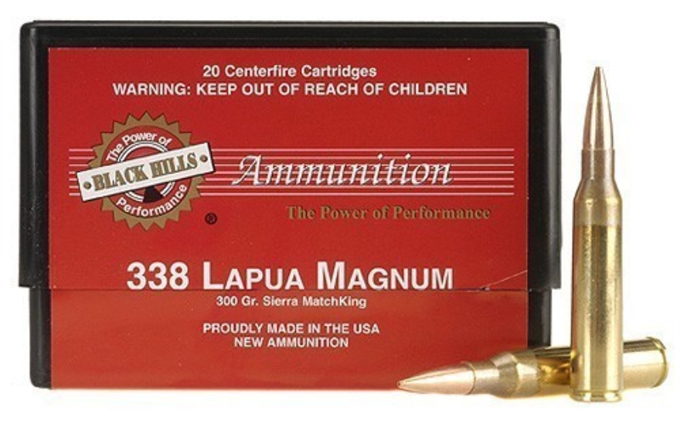 The .338 Lapua Magnum has been used to successfully strike targets out to 2475 metres and everywhere in between. The above engagement was carried out by Corporal Craig Harrison of the Blues & Royals in November 2009 in Helmand province, Afghanistan. This is the longest ever confirmed kill by a sniper on the modern battlefield and it took Corporal Harrison nine rounds to correct his elevation before successfully neutralising two Taliban machine gunners. If you were to show up at a precision rifle shoot such as the Gunslinger event, you would count more .338 Lapua Magnums on the line than any other calibre. Whether you love or hate long range hunting the cartridge is an excellent performer on deer-sized game out to and beyond 1400 metres. With the correct equipment and plenty of practice ethical hunting at these distances is not an issue, but I can hear the e-mails coming already! 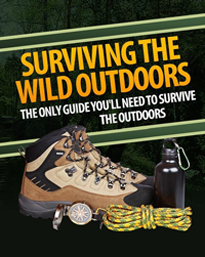 (Ed: hunting at those kind of ranges is not endorsed by TS). Norma also produces .338LM ammunition, pictured here are 300 grain Sierra hollowpoint boat-tail loads. 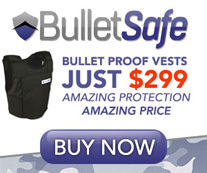 Factory ammunition is readily available but it’s pricey. Hornady manufactures two loads: the 285 grain boattail hollow-point match and the 250 grain boat-tail hollow-point match, both of which are available at around $199 for a box of twenty. 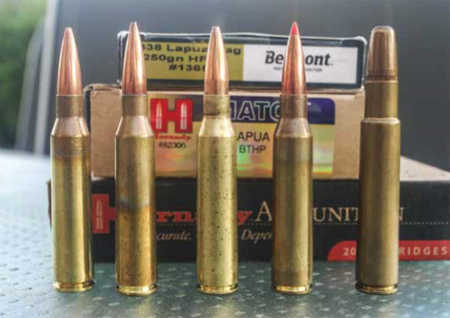 Belmont manufactures a 250 grain Lapua Scenar in Bertram brass at $69 for ten and also stocks Lapua factory ammunition. 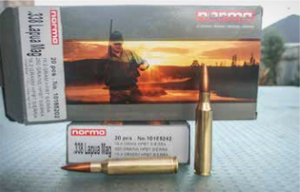 Belmont’s Lapua offerings include the 250 grain Scenar and 300 grain Scenar retailing at $98 for a box of ten rounds. 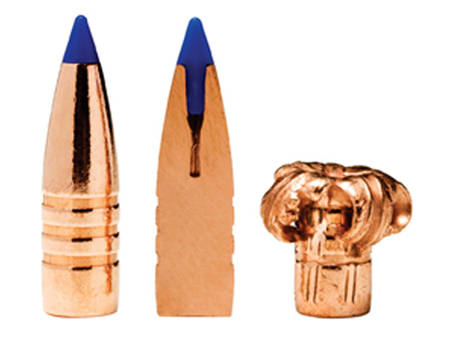 Good powders and projectiles are readily available in New Zealand for the .338LM. Suitable powders are those with a slower burning rate and include N570 from Vihtavuori (recommended by Lapua), AR 2217 and AR 2225 from ADI, IMR 4831 and IMR 7872 from IMR, and also H1000 and Retumbo from Hodgdon. See the attached table for up to date reloading data. Projectiles available range from 160 grains all the way to 300 grains. The most popular choices are in the 250 and 300 grain weight and include the Scenar from Lapua, Elite Hunter and Hybrid Tactical from Berger, and the Match King from Sierra. Hornady offers projectiles in the 250 and 285 grain weights in a hollow-point boat-tail match and has recently released the .338 285 grain A-Max. Most target projectiles are suitable for hunting at extended ranges with the .338 Lapua Magnum, however Berger does not offer a target bullet in .338 as they do with most other calibres. Given the high sectional density and weight of most .338 calibre projectiles you would have to be shooting dangerous game at very close ranges to risk bullet failure. My own experience with the .338 is that it is a quick and efficient killer on deer-sized game even at extended ranges. 250 GR PROJECTILE STARTING LOADS MAX LOADS! The .338 Lapua Magnum is used in all corners of the globe for military applications, hunting and competitive shooting alike. 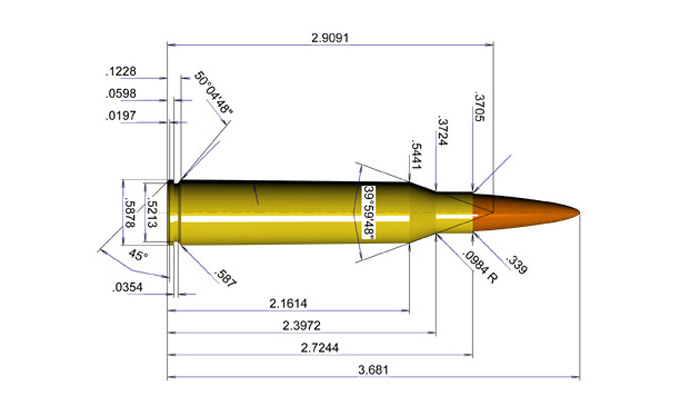 Its popularity stems from its ability to accurately engage targets to well beyond 1500 metres with a variety of ammunition and ability to fill the niche between the 7.62x51mm and .50 BMG. 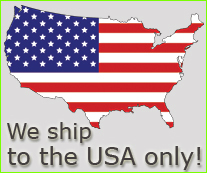 Currently twenty eight countries use the .338 Lapua Magnum and over twenty major firearms manufacturers produce rifles in .338 Lapua Magnum. So if you are looking for a cartridge that can reach out and touch something at over a mile and deliver 720 ft/lbs of energy when it gets there, then look no further. Warm barrels and stay safe out there! Frazer.